It's not often we take the opportunity to review audio gear such as the Zoom H4n Handy Recorder, but since we started podcasting here at BCCHardware (through WeeklyTechUpdate), we've had reason to check out some high-quality audio products for use in the office and on the road. When at home, some of our equipment includes Samson C0U3 USB Microphone as well as CAD GXL3000 mics and a Behringer Xenyx 1204 Mixer. We decided that we wanted to go big or go home and although there is a lot better equipment available for thousands of dollars, we picked some good gear that gives WeeklyTechUpdate an edge over some other podcasts in terms of audio quality at least. The problem with all this gear is that it weighs in the neighborhood of 40 lbs. (18Kg) and this becomes a bit of a pain to pack in your suitcase when traveling to CES in Las Vegas or CeBIT in Hanover. It was prior to CeBIT that we contacted Samson to find out if they could spot us a microphone for the road and the recommended the H4n. It supports XRL inputs as well as 1/4" mono inputs, and a lot more - including built-in stereo microphones so we thought we'd give it a go. Unfortunately, it never arrived until the day before we left and our initial experience with it was less than stellar. After we got used to the Handy Recorder, moved out of our 10'x10' cell and have used it more, we've become familiar with how it works and have much better success and our results are much better. What makes the H4n so handy is that it comes with everything you need to get up and running - other than batteries. In the box we received the recorder, a windscreen, USB cable, power adapter, 1GB SD Card, software CD (contains Cubase LE) and a nice thick manual. 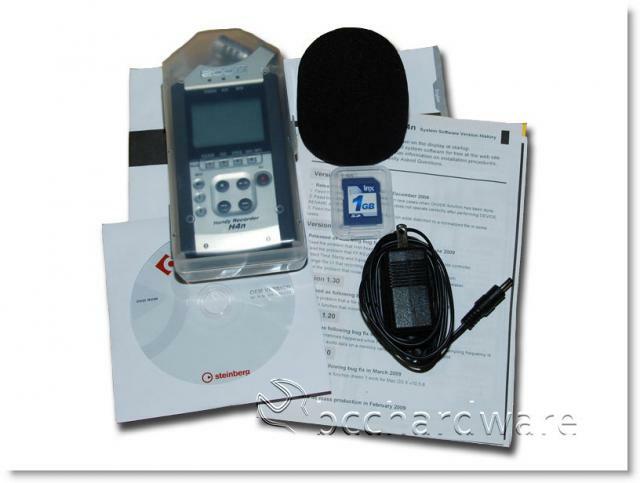 The H4n has a lot of features and there may be times that you're grateful for the manual. 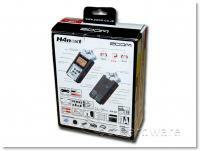 Before we take a closer look at the Zoom H4n, we'll go through a brief list of features. 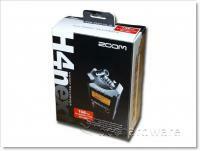 There is a lot more information about the Zoom H4n at the product page and if you want all the juicy details make sure to check it out. On the next page we'll take a closer look at the H4n before we share our thoughts, experiences and sample audio with you.